They say a picture is worth a thousand words. Given that this particular storage array had a capacity of about 20 terabytes this picture is arguably worth two trillion words. I’ll try to use far less words than that to explain this photo. What is this catastrophe, you ask? Clearly not a good day for some storage administrator (and trust me when I tell you I know all too well how he felt at this moment). Let’s rewind and figure out how things got to this point, shall we? Replicating data to a disaster recovery site is really a great thing – provided you have either oodles of bandwidth or many days (weeks?) to get your data protected, or what we in the business call TTP (Time to Protect). Until your data is fully replicated or “sync’d up” as we say, you’re really at continued risk. Since not many companies can afford the high speed WAN connectivity to pull this off, traditional storage vendors offer a simple, if not brute force, solution… I call this the CTAM protocol. That’s right, the Cargo Truck Async Mirror protocol involves standing up the DR array in your production data center and performing an initial sync between the production and DR systems over LAN or FC speeds. 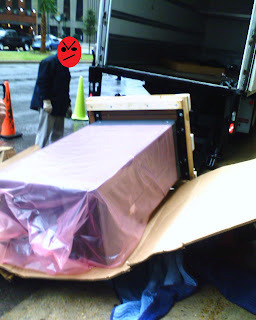 In addition to potential problems like the one depicted in the picture you have the cost of your storage vendors' professional services for an additional install, plus the packing and shipping services (and trust me you do NOT want to go cheap here) as well as dealing with your risk officer and explaining the detailed shipping process which includes hourly tracking updates (typically when you’d rather be sleeping). Fortunately, Compellent customers have another option in Portable Volume. A couple weeks ago I called one of my customers, Dane Babin, CIO of Business First Bank to see if he was free for lunch and he told me that he’d sent his Portable Volume kit to his DR site earlier that morning with a kickstart replication. He’d have time for lunch and then we could both go back to his office and finish up the process. When we got back he went straight to his office and I set my gear down and popped over to the break room for a bottle of water. By the time I got back, he was grinning from ear to ear having just finished the process of importing the data and could go into the weekend secure in the knowledge that his company's critical data was protected at a DR site four hours away. I asked Dane what Portable Volume meant to him as a customer and he said, "It was very easy. I connected it at my production site, made a few clicks in Enterprise Manager and a short time later packed up the drives and sent them off. I had a branch manager connect at the DR site and the Storage Center immediately recognized the drives and started copying data. It was so easy even a branch manager could do it!" Not that branch managers aren't capable people, but the point is Dane didn't need to tie up one of his engineers to get the job done. Dane can reuse his Portable Volume kit to kick start more replications in the future or to help recover his production site if the need should arise. For a demonstration of Portable Volume in action go to this link featuring Peter Fitch, IT Infrastructure Manager at Rudolph Technologies. Notice Peter mentions being influential as a customer in the design and implementation of Portable Volume - Compellent listens to customers! You can also view a demonstration of Portable Volume here.